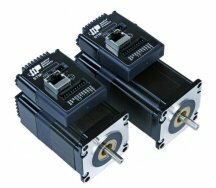 The new STM23 models fuse a high performance motion controller with 100 MBit Ethernet communications to a high torque NEMA23 step motor. Connecting to an Allen-Bradley ControlLogix, CompactLogix or MicroLogix PLC. EtherNet/IP is also available.